Hello! Japan – November: Are you hungry? The Hello Japan! Challenge hosted by Tanabata at In Spring it is the Dawn sets a challenge each month so that we can familiarise ourselves with Japanese culture. October’s challenge was to read or watch something scary, spooky or suspenseful in keeping with the Halloween season. My contribution to this challenge was to read Grotesque by Natsuo Kirino which I posted over here. November’s challenge is something slightly different, and as you can see from the title to this blog, it’s all about Japanese food! Luckily for me, it’s my birthday this month, and my friends and I scooted over to Sushi Cafe Maco in Crouch End run by a Japanese friend of mine, as he had prepared a sumptuous feast for us. Yup, it was sukiyaki time! 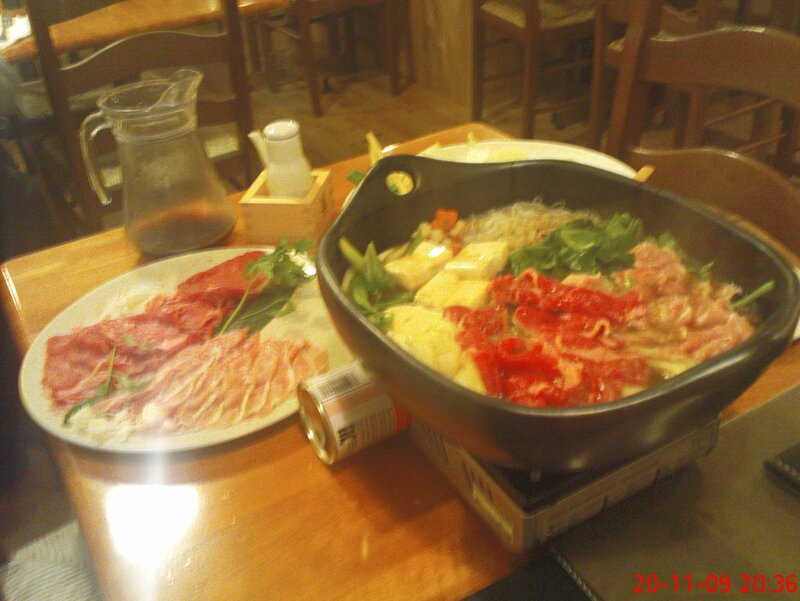 Sukiyaki is one of those dishes that you eat together as a family. Together with nabe (hotpot), it’s something that is enjoyed when shared with a large number of people, and especially over winter, as we huddle together over the steaming pot and watch the ingredients cooking. It’s one of those dishes (like an English roast) that when it is announced will ellicit gasps of excitement and pleasure from everyone. I remember many a happy wintry evening in Japan, sitting at the kotatsu (a shallow table with a built-in heater underneath covered by a blanket where everyone sits around warming their cold toes) in my grandfather’s house waiting for him to give me some of his beef (beef was also something to celebrate in Japan because it’s normally so expensive.) I can’t remember the last time I had sukiyaki so you can imagine my excitement. There was tofu, chinese cabbage, onion, spring onion, mushroom, greens, shirataki noodles (a gelatinous noodle made from the konjac plant), beef and pork all cooking away merrily in a sauce made of soy sauce, sugar and mirin. This was a one-off special as my friend Maco is still trying to find the best way of cooking sukiyaki in his restaurant. Hopefully he will put it on the menu soon as it was very oishii (delicious)! 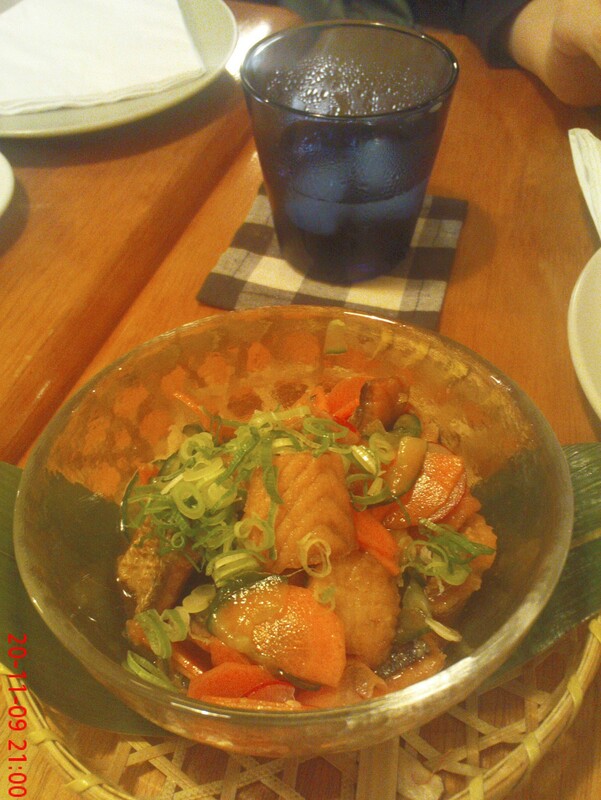 We also had the salmon skin salad which is one of my favourite dishes in the restaurant. And of course some sushi, as Maco is a fine sushi chef. The vinegared mackerel sushi (oshi saba zushi) is one of my favourites. All washed down with umeshu sour (plum wine mixed with soda). And here is also a picture of one of my daily lunches I have at work: it’s healthy, yummy, not too expensive and you can buy it from Delicatessen Yoshino on Shaftesbury Avenue. 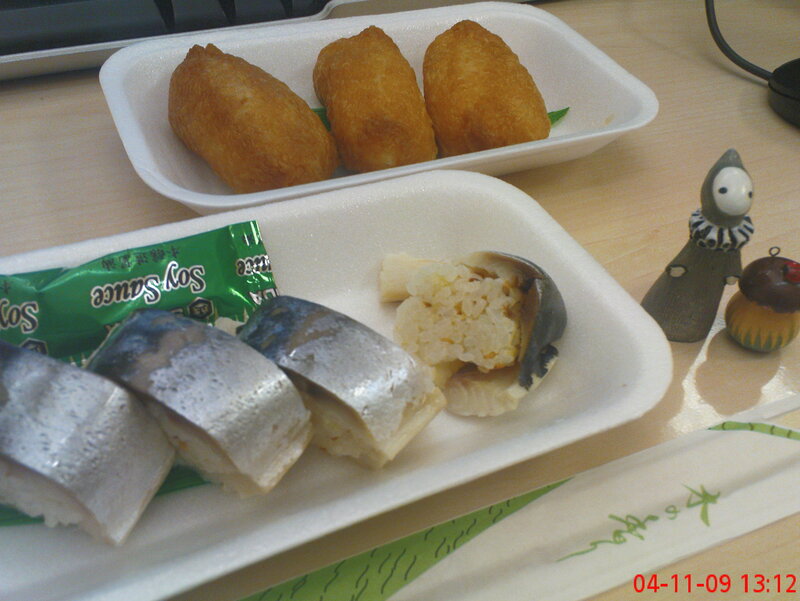 My favourites are mackerel sushi (saba zushi) and oinari san (or inari zushi made from sweetened, fried beancurd). Much, much nicer than the sushi you get from supermarkets and coffee chains, trust me. * as of 21.12.09 Sushi Cafe Maco has closed due to problems with their lease. They are hoping to open again once they have found a suitable venue and I’ll keep you posted. *please note that I have paid for all the food I’ve consumed. Although I’m always happy to try food for free! Sukiyaki looks really good, I’m enviuos as I’d love to try it. Japanese food is very much in a minority in Northern Ireland! OMG this food looks really yummy. We have no Japanese restaraunts near us, or anywhere to buy ingredients. I’m off to Manchester tomorrow so hope to buy some veggie sushi there! I actually prefer sashimi to sushi (that’s sushi without the rice – I’m not a great fan of vinegary rice, although I have a Japanese friend who actually prefers that to white rice…) And also I find that white fish is easier on the palate that red fish such as tuna, which feels a little bloody, and salmon, which is a little oily. I always go for the white fish sashima (sorry I don’t know the names.) But I think it’s something that grows on you. I really like my sashimi, but I tried the raw herring that they sell in stalls all over The Netherlands and was unable to eat that. That was a real surprise to me! Oh my god this has just made me soooooo hungry! I dont have any delicious food like that in so will just have to make do with Peanut Butter and toast. I adore Japenese food so this would have been utter heaven for me. Delightful. Peanut butter and toast is delicious too! London now has so many Japanese, Korean and Thai restaurants that are authentic and serve delicious food that doesn’t cost a bomb. If you want any recommendations, let me know, although I tend to know more about restaurants in the centre and in north London. It all sounds SO good! But you didn’t introduce your little lunchtime friend on the right? Ah, that would be my little work poppet standing next to a wooden mushroom from St. Petersburg! There’s still time until the end of the month. I always enjoy your bento posts and would have thought that a bento would be ideal for this challenge. Good luck! Nice write up. Bad news about Cafe Maco’s lease but glad that it’s nothing worse. Really looking forward to hearing about where they set up the new shop. Very bad news about maco closing down. I was almost in tears. Hope it opens up again very soon. Keep us posted please! Me too. I’ll post as soon as I hear any news.